Last edited by mtrotnic; Thu Jan 17 2019 10:21 PM. How heavy is your safe? 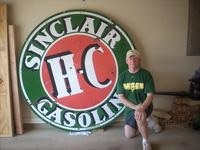 And would you be interested in a trade for a 30” Conoco Ethyl Gasoline sign? It is a reproduction sign I purchased for $700. Appreciate the offer but not interested in any trades.